A drama about dealing with change late in life, 5 Flights Up (also known as Ruth and Alex) is an amiable story about what matters and why. Alex and Ruth Carver (Morgan Freeman and Diane Keaton) are an elderly biracial couple who have lived in the same 5 story walk up Brooklyn apartment for more than 30 years. 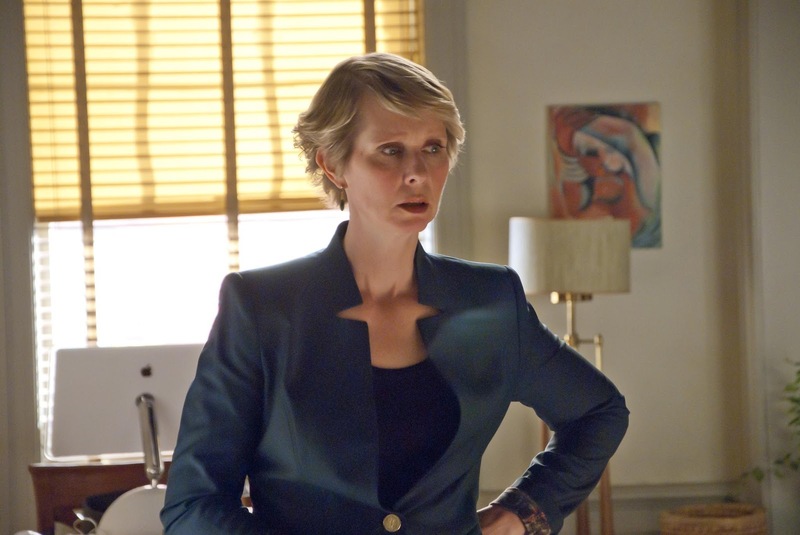 The lack of an elevator is catching up with them, and Ruth's niece Lilly (Cynthia Nixon), a real estate agent, has convinced them it's time to sell. Alex, a struggling artist all his life, is not quite sure that selling is the right thing to do, but grumpily goes along. As prospective buyers troop through their apartment during an open house, he recalls their early days as a ground breaking newly-married couple (Korey Jackson and Claire van der Boom) moving into the neighbourhood. A bidding war heats up for the Carver's unit and the selling price approaches $1 million. As Ruth and Alex start their own frantic search for another place to live, two other stories unfold simultaneously: the media breathlessly covers a police chase for a possible terrorist on the loose in New York City; and the Carver's aging dog Dorothy undergoes expensive surgery for a back ailment. Directed by Richard Loncraine and written by Charlie Peters, 5 Flights Up focuses on the deeply personal crossroads of one couple, but captures some universally applicable truths. The film's strength is that there is absolutely nothing unique about the decision point facing Alex and Ruth. Indeed, even the expanded narrative about the media's frenzy over a terrorist manhunt and the pet in distress stays in the realm of the routine. Loncraine uses the familiar to focus on a couple still very much comfortably in love grappling with uncomfortable changes at an advanced stage in their relationship, and the human dynamics and emotions ring true. The film enjoys a calm, modest pace, the economical 92 minutes suitable for the small story about big transformations. Brooklyn has gentrified, real estate prices are unimaginable, the world of violence and 24 hour inaccurate coverage is at the literal doorstep, and everything demands accelerated attention. Alex views the world around with soulful eyes, accepting the need for time to move on but not quite sure that it's for the better. The only solid rock foundation is the love between Alex and Ruth. They accommodate and tolerate each other with a natural commitment built on years of trust. Both contribute pebbles in the shoes of the marriage, but as with all couples who have made it through decades of marriage, Alex and Ruth are not so much two distinct people as they are one entity driven by two complementary psyches. Loncraine captures their union with a serene beauty: no matter what craziness is going on, this is an unshakable marriage. 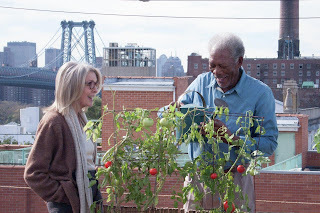 Diane Keaton and Morgan Freeman instantaneously click as a couple, and the veterans navigate the film with a natural smoothness. Cynthia Nixon nails the manic intensity of a real estate agent operating on hyperdrive and surviving on the oxygen emanating from a restless cell phone. 5 Flights Up may be about nothing that matters in the grand scheme of things, and it ambles towards the contentment of a predictable outcome. But it achieves its modest goals with the warmth of seasoned affection.